It takes a special kind of property to reflect its location and culture, but it takes a truly interesting property to reflect its history, and then share that with guests through design. 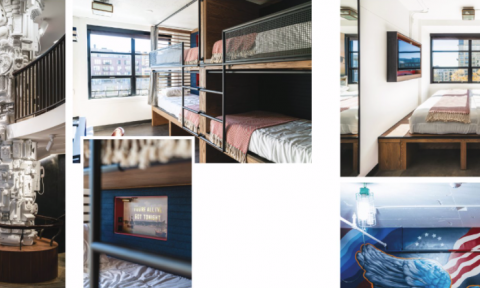 Newly opened, The Revolution Hotel in Boston not only showcases the city’s storied past through its decor and art installations but is a piece of artwork itself. The adaptive-reuse is what Bruce A. Percelay, chairman/founder of the Mount Vernon Company - the hotel’s owner - refers to as “both a blessing and a curse,” a component that informed the property’s unique design along the way. According to David Snell, senior associate at Prellwitz Chilinski Associates Inc. (PCA) - the hotel’s design team - the location subjects any exterior work to the review and approval of the Landmarks Commission, but this triggered innovation, not restriction. “The process encouraged our team to get creative with ideas that would balance the needs of the community to uphold their mandate while also allowing for new functionality for the building,” Snell said. The original structure, which was the country’s first YWCA, comprises two interconnected seven-story buildings - a 17,500 sq. ft. brick building and a 56,000 sq. ft. concrete building added in 1950. The rooms only average 120 sq. ft., a blessing in disguise perhaps, allowing for an approachable price point. The older part of the building, dating back to approximately 1880, presented some challenges during development. Having buildings of different materials and, consequently, different code considerations was tricky to renovate, and required creativity. In addition, a lot of rooms didn’t have bathrooms. Also, rather than having a true common bathroom experience, bathroom “suites” were created, giving guests a private area off of the hotel corridors. “You go in, close the door. It’s a totally private bathroom experience; it just so happens it might be across the hall, but you’re not interacting with others so we have taken the edge off of that,” Percelay said. Other modern touches include new in-room window treatments, USB charging stations and HVAC units. “It will clearly make for a comfortable guest experience but in a building that is obviously not brand new which, I think, adds considerably to the charm of the environment,” Percelay said. Also adding charm is the lobby, which was well-preserved, including its stairway and ceiling. “We didn’t touch the lobby because I don’t think we could have done it better if we started from scratch,” he said. Preservation ultimately guided the design of the lobby, despite the structural hurdles, adding not only charm but insight as well. “Its history and architecture became our inspiration - we took great care to celebrate its original use, as well as to embrace, preserve and expose its original architecture,” Snell said. According to Snell, the design team was able to preserve the existing layout and concrete floors as well. Creativity was important here, with this property especially, which Percelay explains is more of an experience, rather than just a place to stay. “It’s our belief that this will be the most interesting hotel in the city of Boston. It would be very difficult for a large, national hotel chain - as hard as they try to come up with these cool millennial concepts - to execute what we did,” Percelay said. Through its artwork, the property reflects the city’s history and “firsts.” For example, refurbished mailboxes from the original building are now in the lobby, paying homage to the nation’s first post office, which was located in Boston. “We’ll make sure our staff tells people that it’s not there for decoration, that Boston invented the first post office. Anything you see here and you wonder why it’s here, well the reason it’s here is because it was invented here,” Percelay said. It’s truly decor with a purpose, with a story around every corner. Beams were built around the lobby café in the style of tea crates with imprinted text and graphics, a nod to the Boston Tea Party. Theres also a wooden bar top in the hotel’s co-working space, Conspire, made out of a slab from the famous Big Old Elm tree from Boston’s Back Bay, further telling the story of Boston’s past. According to Snell, the bar top is finished with significant dates from Boston’s history, hand burnished into the wood to connect the years of the events to the rings of the tree. “In a departure from an obvious, literal presentation, the design lets people explore and discover a broad spectrum of information about Boston ‘firsts’ at their own pace,” Snell said. Boston firsts are best represented perhaps with the “Innovation Tower” - a sculptural installation spanning three floors and the monochromatic focal point of the hotel’s lobby - featuring objects that represent local inventions. Also part of the design is a mural in the lobby celebrating this revolutionary mentality, which tells a story of its own through spray paint and collages, along with an antique brass statue of Benjamin Franklin.